*Warning*: This recipe contains 2 sticks of butter. 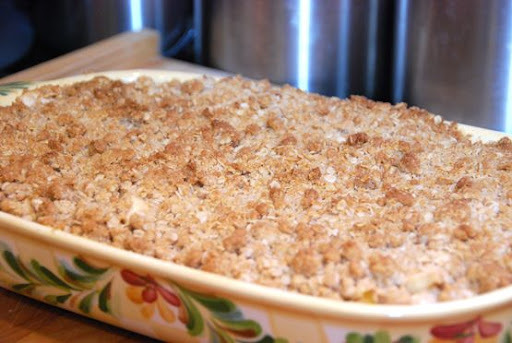 Now that we have that out of the way, let's move on to the delicious simplicity that is this Apple Crisp. 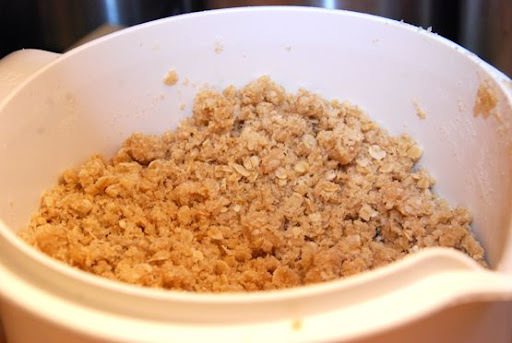 When I set out to come up with a recipe for Apple Crisp, I realized that there are several things I like and don't like about most apple crisp recipes. Like: Topping. I like lots and lots of topping. Dislike: Spices. As I've mentioned in recipes past, too many spices make me feel all itchy and scratchy in the mouth. I like very simple spices in desserts. Like: Topping. Have we been over this already? Dislike: Mushy apples. 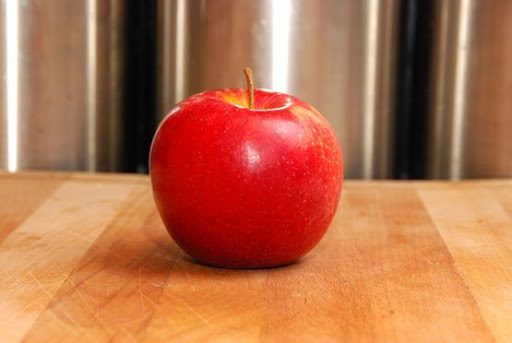 I like chunky bites of apple instead of thin slices. And, I like there to be a bit of a bite left to the apples. Soft, gooey - but still hold their shape and be on the firmer side of soft. 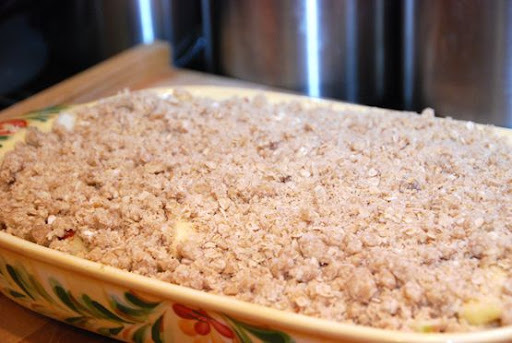 This recipe for Apple Crisp has TONS of topping. 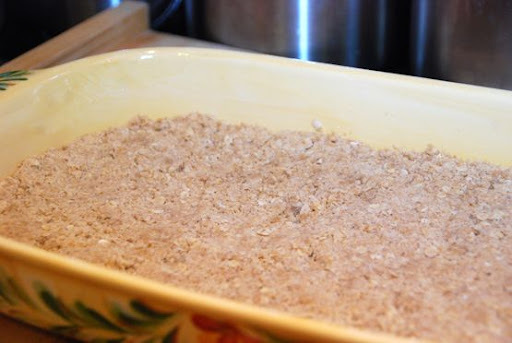 It also has a bottom layer, which not only gives it more "topping" per say, but also serves to soak up a lot of the juice from the apples and prevent them from turning to mush underneath the topping. 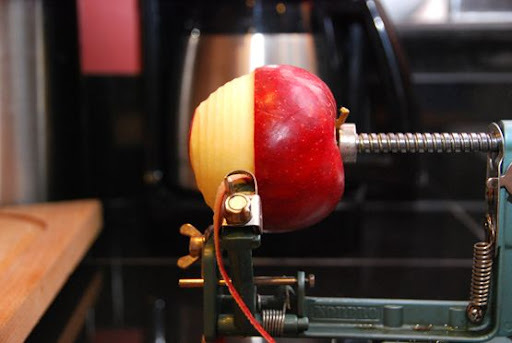 Hence, the apples stay on the firmer side of soft. EEK! I love it when a recipe comes together like that. I brought my camera along with me on this one - because I love taking pictures of the food that I'm baking, and because even if you are a novice cook, you should make apple crisp this fall - and I wanna make it as easy as possible for you to make it! 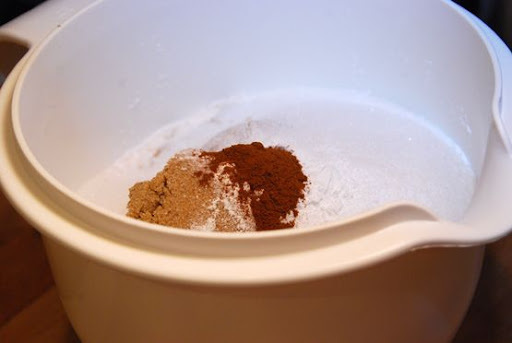 Combine the oats, flour, brown sugar, sugar, baking soda, baking powder, and cinnamon in a medium sized bowl. Add one cup of melted butter. Lightly grease a 9" x 13" baking dish with butter or cooking spray. It forms a perfect bottom crust. Which has a very big job, as you're about to see. Peel, core, and slice about 8 apples. I prefer Jonagolds or Granny Smiths because of their slight tartness. But, you can use any type or combination of good baking apples that you like. 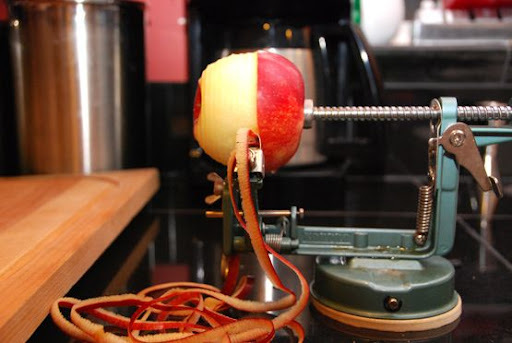 Several years ago, I bought a handy little apple peeler gadget that I pull out whenever I need to peel a bunch of apples. It's a great time saver when making this recipe. 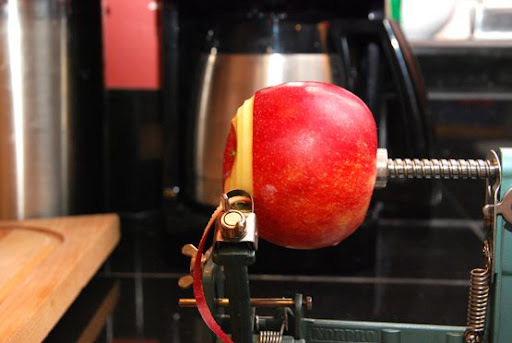 Once you've peeled the apples, cut them into good size slices. You're not looking for thin slices, but about 1/4 inch thick slices. 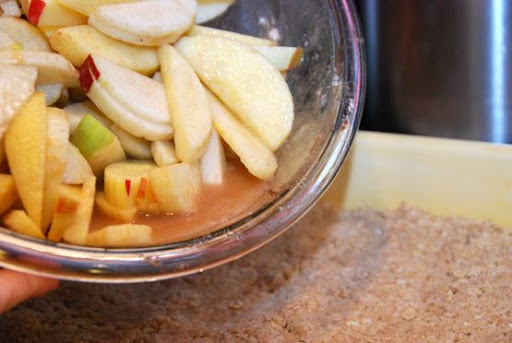 Add sugar, flour and cinnamon to the apples and toss. 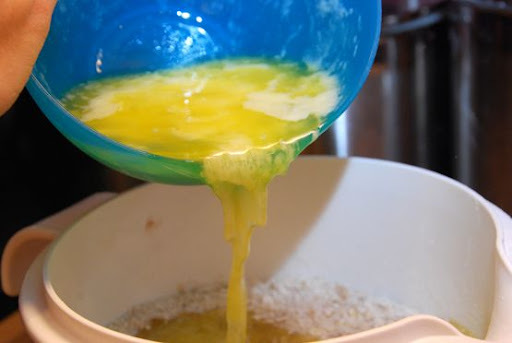 Then add 1/2 cup of water and mix all together. Pour apple mixture into the baking pan and on top of bottom crust. See all of that juice? It's about to quadruple during the baking process. 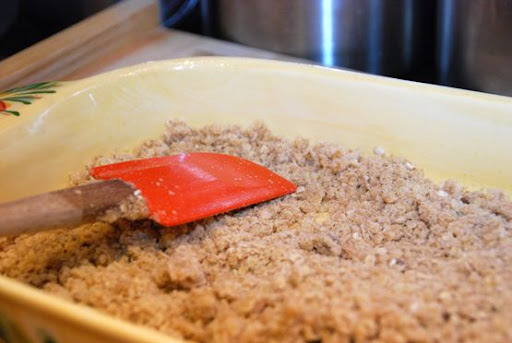 That bottom crust will soak up more and more of that juice as the apples cook down and create a soft, warm bottom layer on this apple crisp that is absolutely divine. Arrange apples evenly over bottom crust. 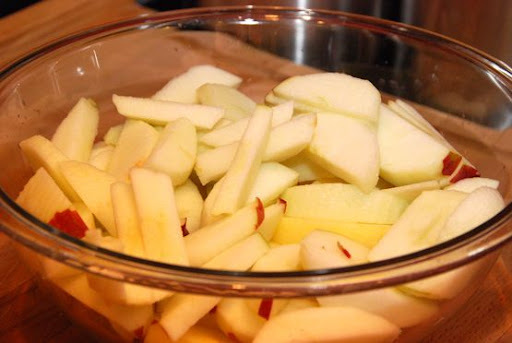 Top apples with remaining topping. This is what it looks like going into the oven. And, this is what it looks like coming out. Crunchy, sweet. Happy. 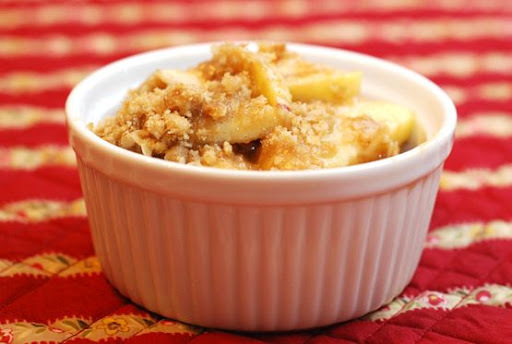 I like to serve this Apple Crisp in small, white ramekins. There is something so warm and nostalgic and wonderful about that. And, that is how I make Apple Crisp. Warm, gooey, soft bottom layer. Soft, but still a bit firm apples in the middle. 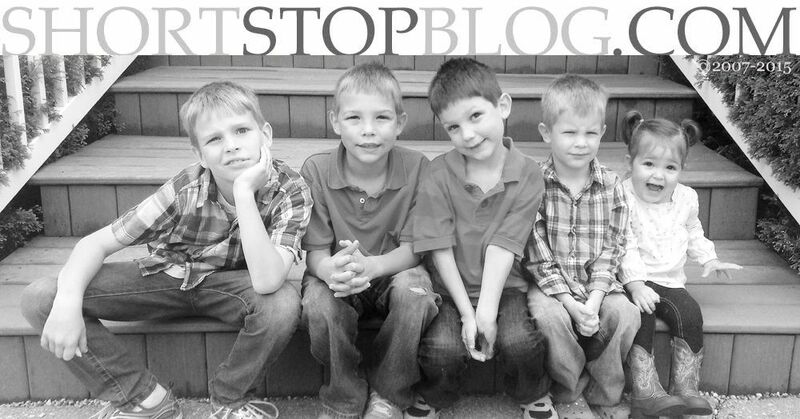 I hope you enjoy this one as much as we do! Preheat oven to 350 degrees. 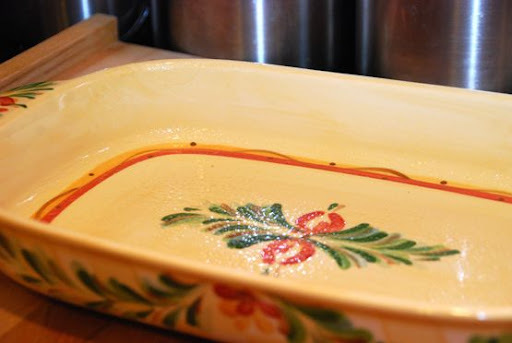 Grease a 9" x 13" baking dish with cooking spray or butter. Press 1 1/2 cups of mixture into bottom of baking dish to form bottom crust. Set rest of mixture aside. 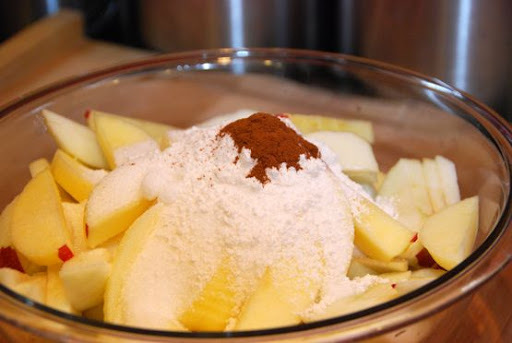 In a large bowl, combine apple slices, sugar, flour, cinnamon and water. 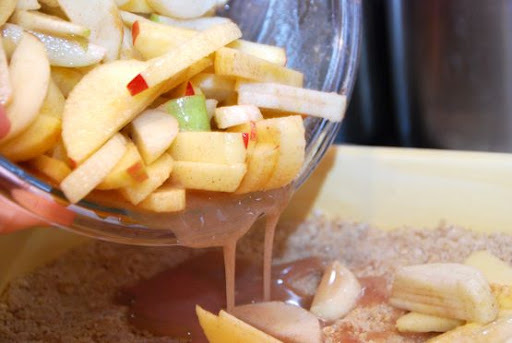 Mix until apples are coated. 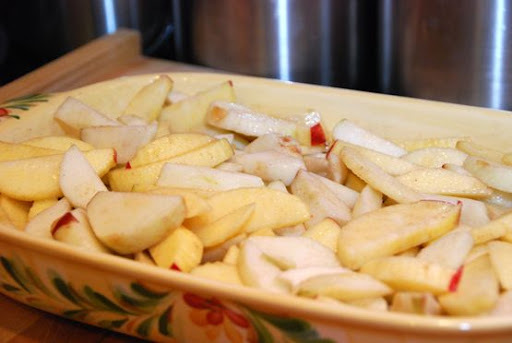 Pour apples over bottom crust and spread evenly. 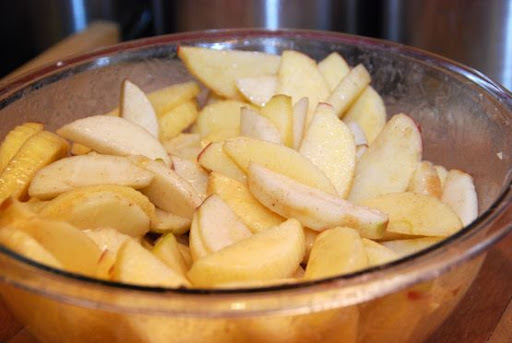 Top apples with remaining topping. Bake at 350 degrees for 45 minutes or until top crust is golden and crispy. Serve warm or cold, plain or with whipped cream or ice cream. Eat until fat and happy! *This recipe makes a full 9" x 13" dish. It's a lot of apple crisp (which my family of 5 had no problems finishing in two days). But, you can make half of this recipe, and bake it in an 8" x 8" or 9" x 9" or in a deep dish pie plate. Just halve the ingredients and bake as directed. I'm going to make this tomorrow. Gotta run to the store first. 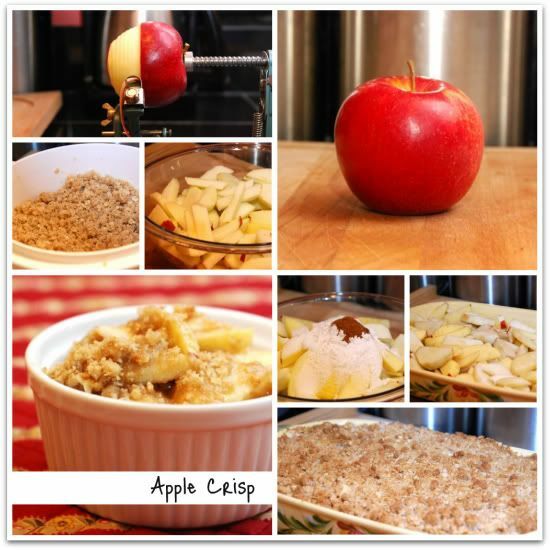 I'm always looking for a new apple crisp recipe, and your recipes are always great! I'll be trying this one! First, yum. We got a good deal of apples at the orchard yesterday, so as soon as the cake and muffins are gone (we are swimming in dessert over here - LOL) I'm gonna try this. Thanks for letting me know. I fixed it in the tutorial. And, YES - that's definitely cinnamon you see there in the topping! I made this for my book club last night. I needed something fast and easy - this fit the bill (especially since I had all the ingredients on hand), even some organic apples that needed to get used. I got several requests for the recipe. Definitely a keeper! Sounds delish!! Can't wait to try it! Thanks Sarah and may the Lord bless you and your family. I took this out of the oven half an hour ago. Half is gone. Outstanding. I was concerned it would be dry, and it wasn't at all. Very good!! Only way I will make apple crisp from now on.